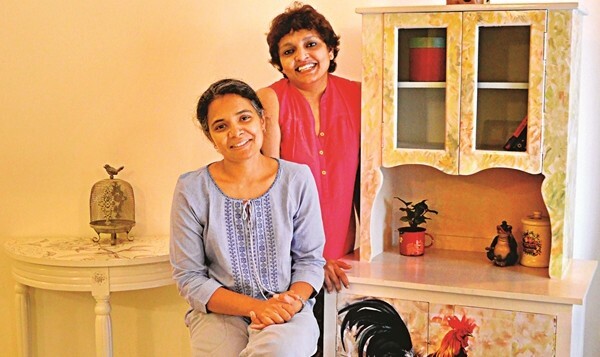 intage European farm style decoupage and hand-painted furniture is the order of the day at Bli & Chi, launched in January, and wea��re not complaining. A refreshing change from the walnut and chocolate browns and a far cry from the plasticky neons or faux distressed pieces dominating the market at the moment, their whimsical creations are a tasteful way to add some colour into your home. 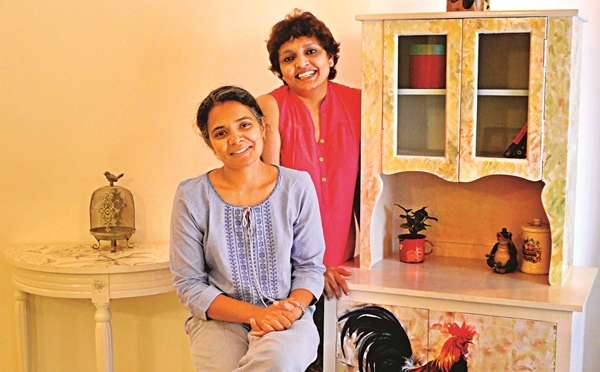 Started by long time friends, Chitra Viswanathan and Bubli Srikanth (whose names form Bli and Chi) the idea came to them on their extensive travels across Europe. a�?Since wea��re quite close, wea��d always travel together and see all these lovely farm style night stands and console tables that we could never bring back. So we thought why not do it ourselves,a�? shares Viswanathan, a graphic designer. Having also run a childrena��s furniture store in the past, the duo was well equipped to start off on their new business plan. a�?Make no mistake, we hardly think wea��re going to become highly successful businesswomen, but we are honest with what we do and only create pieces that we would personally love to have in our homes,a�? explains Srikanth, previously an adversiting professional. Their collection includes side and corner tables, cabinets, cupboards, shelves, chests, benches and dressers and they mainly use teak or sal wood for the legs but the body can very often vary between ply, pine, sal, rubber and teak. So a piece is usually made of two different types of wood. a�?For most of the pieces, the legs are very elaborate, so we need something strong like teak,a�? says Viswanathan. 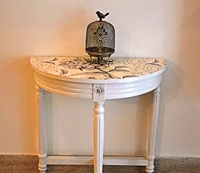 For example, a pale white console table featuring deep pink and black work on its curved legs was made using 30 different pieces of paper ( through the process of decoupage). a�?Ita��s our showstopper and it was a painstaking process making it, but we enjoyed every moment of it,a�? says Viswanathan. We were quite taken by their creamy white bar stools with hand-painted blue birds on the seat. Another multipurpose, dull mustard yellow table hand-painted with lemons, caught our eye too. The use of colour is also quite restrained and pleasing to the eye, so while the furniture is colourful ita��s not garish. a�?Wea��ve stuck to English and French aesthetics, so the pieces are right out of Downton Abbey,a�? laughs Viswanathan, adding, a�?Youa��ll see that the colour palette sticks to shades like dull teal, brick red and pale blue.a�? As ita��s a labour intensive process and each article takes an average of two weeks to complete, bespoke orders are not undertaken at the moment.